This series is part of the exhibition The Unreliable Narrator in fall of 2017 at the Sun Valley Center for the Arts, alongside the work of Mark Dion, Deb Sokolow, Holly Andres, Simon Evans™ and Gina Phillips. 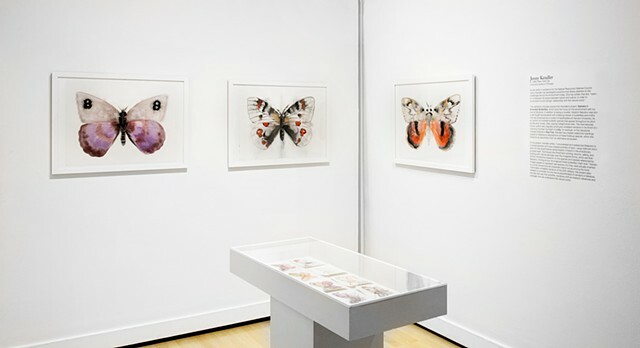 Aside from being one of the master prose-stylists of the 20th century, author Vladimir Nabokov was also a trained lepidopterist, and for a time curator of lepidoptera at the Museum of Comparative Zoology at Harvard University. He discovered and named tens of species, and conceived of a controversial theory on the evolution of Polyommatus blues—which would only be vindicated in recent years. 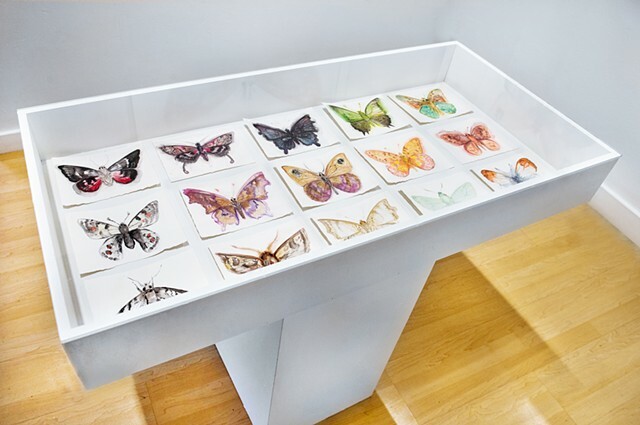 For Nabokov, butterflies and moths were a lifelong obsession, and he worked them into both his science and his fiction. I share this passion, which perhaps, for both of us, started before birth. 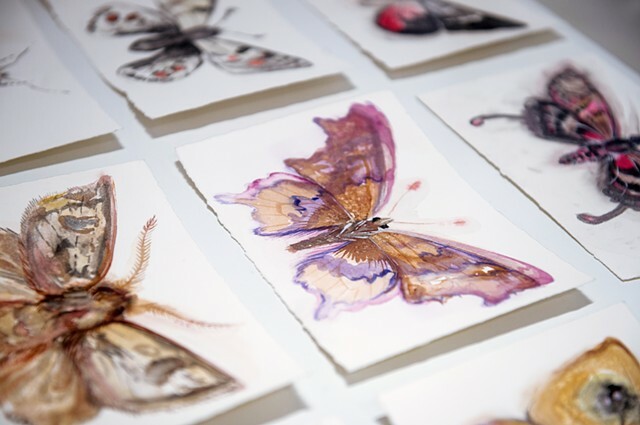 The first book I ever owned was a large and beautiful one titled simply Butterflies—given to me while I was still in the womb by an entomologist friend of my father. 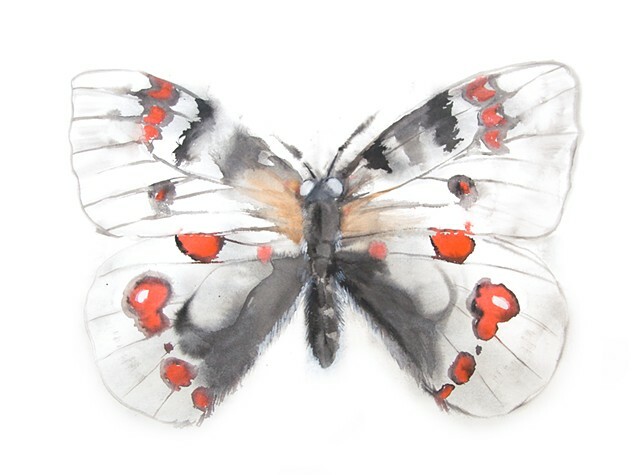 Nabokov peppered his famous novels and short stories with often highly metaphoric and amusingly-possible-or-impossible imaginary butterflies. For this project, I enumerated and researched these invented species and have created portraits of each, using methods which allow for the experimental randomization inherent in the evolutionary process itself. 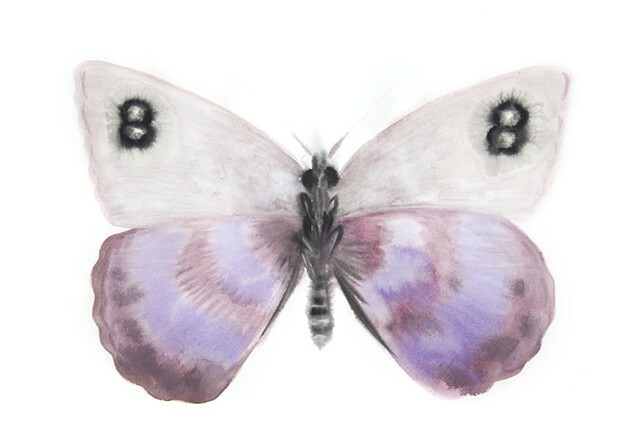 Techniques like Rorschach printing, blooms, salting, and blotting with natural sponges start the imagined forms, which are then further informed by research on the species and habitats referenced by Nabokov, hinting at how he imagined these butterflies might look, while allowing the medium to also play a role in each species 'evolution.' Interestingly, Nabokov took umbrage with some particulars of Darwin’s Theory of Evolution Natural Selection, hinting that he didn't believe it could explain the miraculous mimicry he was so fond of in the world of insects. Nabokov seems to want to keep the 'calculation' of natural selection from disrobing the mystery and beauty of the natural world. But in the first half of the twentieth century, Darwin's masterful theory was not yet congealed, and I believe were Nabokov alive today, he would see that all the complexity, oddity, chance and beauty he delighted in is not dulled at all, but enhanced by an understanding of the various processes of evolution. 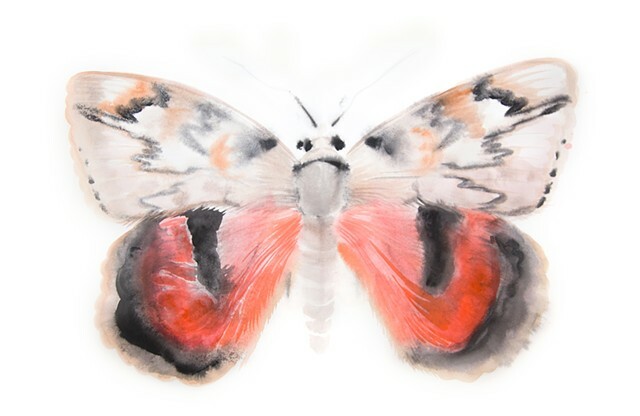 As an example of the delightful complexity of the evolutionary dance, where mimicry plays a central role, one of the invented species I find most interesting is from Ada, or Ardor: "the newly described, fantastically rare vanessian, Nymphalis danaus Nab., orange-brown, with black-and-white foretips, mimicking […] not the Monarch butterfly directly, but the Monarch through the Viceroy, one of the Monarch's best known imitators." We know Nabokov, too, was fond of this invented species, as he makes himself the species’s scientific discoverer (with his Nab. designation appended to the scientific name). 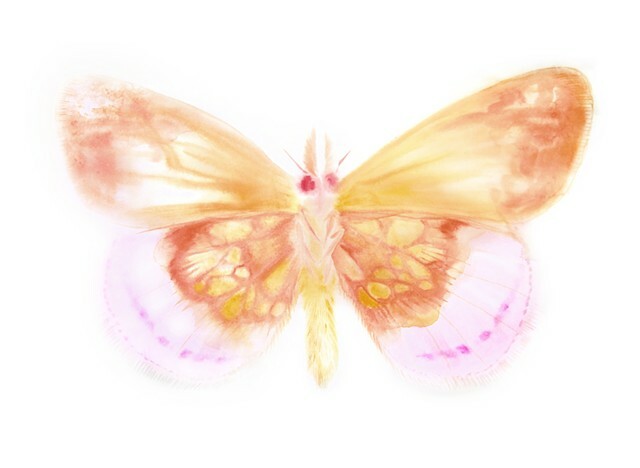 He weaves here an intricate tale of mimicry, which would be well recognized by butterfly connoisseurs. The real butterfly species mentioned, the Viceroy (Limenitis archippus) does indeed mimic the Monarch (Danaus plexippus), but is now considered a co-mimic. In Nabokov's day, it was thought that the tasty Viceory protected itself by copying the appearance of the poisonous Monarch, making it a Batesian mimic—but more recently, it's been discovered that the Viceroy, too, is poisonous, making them both Müllerian mimics—which share warnings to create a stronger signal to predators. The delights are endless, and seem only to multiply—not vanish—as sciences teaches us more about the natural world. 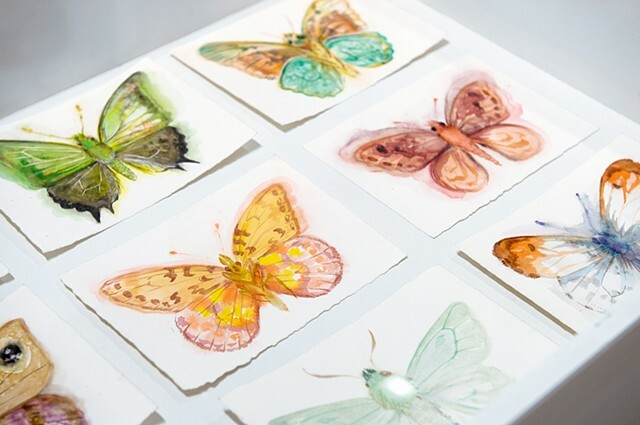 Nabokov often used these invented species to weave complex conceptual content into his works, but it seems that—through his fanciful and biodiverse inventions—he also simply found joy in adding to the remarkable variety of the natural world. A few of these 30+ portraits can be seen above.